Open 08:00-21:30. This piano is designed by Morganic. My 10 year old daughter Gwynnevere finally gets her chance to play a Street Piano, we've missed it the last couple of years. We just stumbled upon it this beauty unexpectantly while making our way through the square, thanks for such a lovely experience. 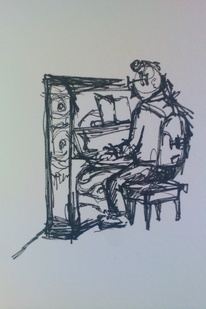 When not holding the book I did some drawing..
Gideon playing in Berkeley Square on a Morganic Golden piano. 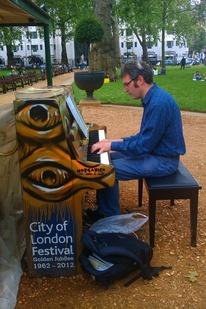 Gideon has been working his way through all the different pianos throughout London in the City of London Festival and is occasionally accompanied by the rest of 'The Elf Band'. I was delighted that my girlfriend, Lucy, accepted my proposal in Berkeley Square Gardens while London Trio played her favourite music composed by Ludovico Einaudi. A huge thank you to Street Pianos and London Trio for making it possible and to my fiancé for saying yes!! 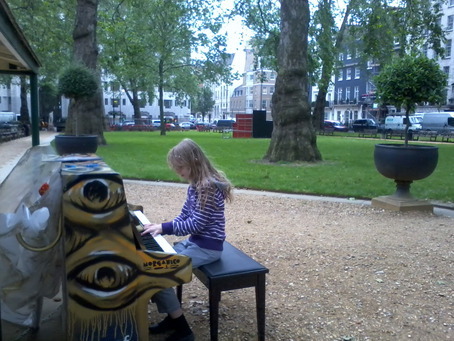 Playing "A Nightingale Sang In Berkeley Square" (of course) while taking a break from a walking tour of London. nice piano : would be great to get the sustain pedal working though : and 3 people enjoyed my playing !